PHUKET: Eight more bodies have been recovered in the ongoing efforts to recover all victims from sunken tour boat Phoenix, Phuket Governor Norraphat Plodthong confirmed today at a press conference held at 5:30pm. The bodies recovered today (July 7) brought the total number of confirmed dead to 41, with 15 more missing, Gov Norraphat said. The search for the remaining victims will continue tomorrow, he added. Gov Norraphat said search teams had recovered "99%" of the victims from the Phoenix, which lies on the seabed of about 20 metres about 1.5 nautical miles off Koh Hei, south of Phuket. Local divers who have joined the effort told The Phuket News that one body remained trapped "under the boat" and that Navy SEAL divers were to attempt to recover that body tomorrow. 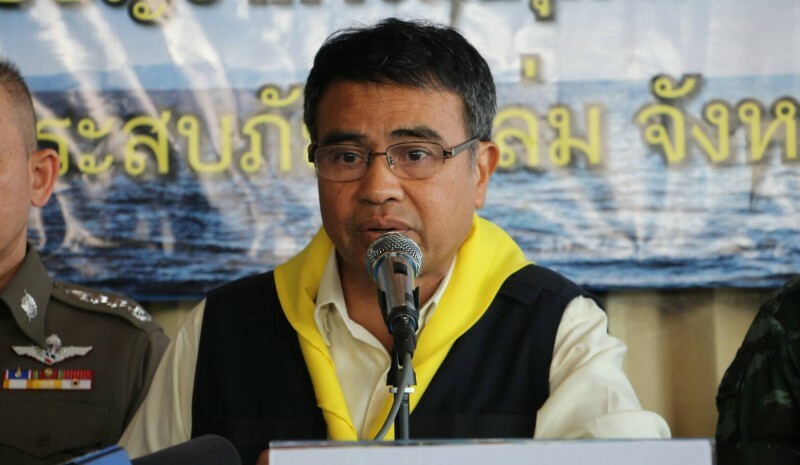 To that end, Chalong Mayor Samran Jindapon late this afternoon called for any persons to donate large plastic drums to be used to float the wreck so that the body can be recovered. "Chalong Municipality now needs 50 tanks of 200 litres (capacity) to fill with air and pull the boat up because now a body has been found under the boat that can not be recovered," he wrote. Persons who could assist were urged to call him directly at 089-7247187. Meanwhile, at the press conference this afternoon Gov Norraphat confirmed that the search on Sunday will include expanding the search area around the wreck by a radius of 500 metres. Police today also confirmed that they have charged the captains of two boats which sank in the storm last on Thursday (July 5). Police had earlier confirmed that Somjing Boontham, the captain of the Phoenix, had been charged with recklessness causing death. Today they confirmed that Metha Limsakul, 58, captain of the Serenata, has also been charged with reckless conduct causing physical and mental harm to others. The Serenata sank off Koh Maithon during the storm late Thursday afternoon with 41 people - now all rescued - on board. Dr Jirapan Taepan, Chief of the Phuket Public Health Office (PPHO), today explained that Forensic Police were leading the operation to identify the bodies of the victims recovered and were co-ordinating with Chinese consular officials to expedite the process of confirming proper identification and releasing of the bodies to families. So far 33 bodies have been identified in the first phase, Dr Jirapan said. With the present Government Officials on Phuket, disasters like this will happen again over and over. They simply have done nothing, and do nothing to prevent these disasters. Unskilled, not active, only reactive in clearing their own a..  with a flower/goodie basket. the life of foreign people in Thailand has no value. Until they comply with international security rules, we will see some disaster every day. Money god is the master. Believe it is also time and sue the Phuket Government whit Phuket Governor in the front for NOT doing their job. They have turned their heads away for many years, now just look at Chalong Pier. There is a gas filling every day (1000++ of liters gasoline) from the beach. It smells gasoline all over the area every morn and afternoon and there are hundreds of tourists walking in this fog of gasoline. Wow, what with all the beaches having life guards and now with 15 missing out of 105 equalling 99%, the governor once again amazes us with his amazing maths skills! It would appear that the 15 are also departed, whether or not the bodies are found. Was the boat over loaded?